From Rhymes with Kerouac, Tears for Mississippi. 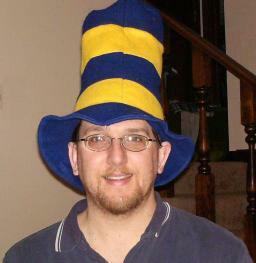 From Bob at I am a Christian Too, Katrina: I Will Not Be Subdued. From Monk-in-Training, a Litany for Katrina and a list of charities that would appreciate your support. Finally, Charity Navigator has some advice on giving wisely. At Eddie's Edge of Faith blog I mentioned in comments that studying Taoism helped strengthen my faith in Christ. It's been about ten years now. I was struggling with lots of questions about my faith, and an acquaintance thought Taoism might be a better fit for me than Christianity. I bought a copy of the Tao Te Ching and started reading. These opening lines state exactly the way I often feel trying to talk about God. To fully describe God is beyond what language can possibly convey. At the time I was enamored with reason, to the point of wanting to deny anything that could not be understood rationally. I wanted everything to be concrete and logical. I was beginning to see that Christianity failed that test. And yet, here was this ancient Taoist sage making a reasonable case that what we can see and touch are not all that is important, even in the material world. Look, it cannot be seen -- it is beyond form. Listen, it cannot be heard -- it is beyond sound. Grasp, it cannot be held -- it is intangible. I've always thought the Christian concept of the Trinity was strange. To me, it seems too complicated to be useful as a doctrine. What does it mean in practical terms? And yet, here in a completely different religion was the idea of three in one. Beyond form, beyond sound, intangible -- like God. Did this help me explain the Trinity? No, but by this point I was starting to realize it was okay to accept some things as mysteries. Reason is a good tool, but it can only go so far. A faith that is subdued by reason is a distorted faith. The more I studied the Tao Te Ching, the more comfortable I felt with Christianity. I have long since lost touch with the person who recommended Taoism to me, but I am forever grateful to him for helping me on my journey. Despite the title of this post, I don't consider myself a "Taoist Christian". If anything, I'm a Christian who has been somewhat influenced by eastern thought, just as I have been influenced by western thought by being born in the United States. Studying another religion did not weaken my faith; it strengthened my faith. Taoism did not give me answers to my questions; it helped me to embrace my questions. I had wanted to contain God, to build a nice little box for him to live in. What I found when I read the Tao Te Ching was a God who cannot be contained. One of the things that has most affected who I have become is my work with Volunteers in Mission (VIM), an outreach of the United Methodist Church. Between 1995 and 2000 I took three one-week trips to Latin America for construction projects. I helped work on a hospital in Costa Rica, two houses in Mexico, and a church in Guatemala. The Guatemala trip was the biggest eye opener. That nation had recently ended a 36-year civil war. We traveled to a small mountain town called San Juan Cotzal to help rebuild the local Methodist church, which had been destroyed in the war. During the late 1970s and early 1980s Cotzal was one of the hot spots of the fighting. Guerrillas used the nearby mountains as a base of operations, and the villagers of Cotzal were caught in the crossfire as both the guerrillas and the Guatemalan army suspected the villagers of aiding the other side. I've written about my Guatemala experiences in The Long Trip Home webzine, but I'm going to talk about something here that I only alluded to in that article. 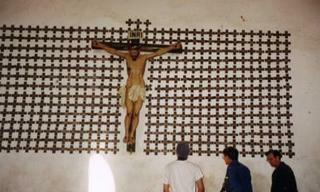 One afternoon we visited the Wall of Martyrs in the local Catholic church. Each cross represents one Cotzal resident who was a victim. The cross contains the person's name and age, the date, and one of the four designations: tortured, kidnapped, murdered, or disappeared. The victims were as old as 70 and as young as five. I counted more than 400 crosses, representing approximately one in every ten Cotzal residents. Almost everyone in that village can see a relative's name on that wall. To have a relative kidnapped, tortured, or murdered would be horrible. I can't even imagine what it would be like. But even more chilling is to have a relative disappeared. To be disappeared is to be kidnapped by government agents and transported to an undisclosed location. In a very small number of cases, the person is taken to a prison and placed in solitary confinement for several years, then released back to the family. But in more than 99% of the cases, the person is murdered and the body disposed in an isolated area far from the kidnap scene. Family members can hope their relative is still alive, but they will inevitably expect the worst. If the body is not found, they will never know. The police will not investigate, though they likely know the murderers. Appeals to courts will not be successful; the courts are part of the same corrupt government that ordered the disapperances. A disappearance makes victims of the entire family. I'm grateful to live in a country where disappearances do not happen as a matter of routine. Millions of people around the world are not so fortunate. I'd like to find a way to end this post on a hopeful note, but I'm not sure it's possible. Millionaire televangelist Pat Robertson called Monday for the assassination of Venezuelan president Hugo Chavez. In one succinct statement Robertson revealed his true nature. He is not a Christian, but a cold-hearted schemer with murder in his heart. He is the moral equivalent of radical Islamist clerics who issue fatwas against political leaders with whom they disagree. Official response from the Bush administration was cautious. State Department spokesman Sean McCormack first insisted on Robertson's rights to speak his mind, then explained that Robertson's views were not shared by the administration. He stopped short of denouncing the remarks. Defense Secretary Donald Rumsfeld said, "He's a private citizen. Private citizens say all kinds of things all the time." Apparently the administration is more concerned about upsetting a long-time ally than distancing itself from such incendiary remarks. Elsewhere the reaction was not so wishy-washy. Bob Edgar of the National Council of Churches called Robertson's statement, "appalling to the point of disbelief." Rev. Barry Lynn of Americans United for the Separation of Church and State said, "It's absolutely chilling to hear a religious leader call for the murder any of political leader." This is just the latest of a long string of ungodly and unchristian statements by Pat Robertson. Yet he is still revered by millions of Americans. Is it any wonder that the United States is losing the respect of the rest of the world? The new issue of Newsweek magazine has a cover story on spirituality in America, along with a poll that you can take on the web. Find a charity you can support financially on an ongoing basis. Become a mentor to a child living in a broken home. Commit to eating out fewer times per week or per month. Donate the money you save to your favorite charity. At Christmas, make a donation in someone's name rather than giving him or her a gift. Write your elected representatives about increasing aid to the world's poor nations. Buy gift certificates to a fast food restaurant. When a homeless person asks you for money, give the certificates, which cannot be used to buy alcohol. None of these will make a huge difference in themselves, but even small actions can help. If you have any additional ideas, please share them. The journey is difficult, immense, at times impossible, yet that will not deter some of us from attempting it. We cannot know all that has happened in the past, or the reason for all of these events, any more than we can with surety discern what lies ahead. We have joined the caravan, you might say, at a certain point; we will travel as far as we can, but we cannot in one lifetime see all that we would like to see or learn all that we hunger to know. Jesus was a carpenter, but the gospels do not provide instructions for building a house. Jesus was a healer, but the gospels don't talk about surgery or medicine. Jesus spoke often about seeds and fields, but his intent was not to give advice about farming. Most Christians understand the Bible to be authoritative in matters of doctrine and faith, but also acknowledge the value of other ways of learning. God gave us a world that operates according to rational principles, and he gave us rational brains to understand the workings of that world. God gave us a way to preserve the knowledge of previous generations, and he gave us ways to build on that knowledge. Therefore, no one thinks it strange, for example, that Habitat for Humanity uses the same techniques for building a house that commercial builders use. Or that a surgeon who is a Christian and another surgeon who is not a Christian may have graduated from the same medical school. Humanity has built up a body of knowledge in each of these specialties, and that body of knowledge is available to anyone, regardless of religious affiliation. The recognition of the value of secular knowledge in understanding the natural world is ingrained in western culture to the extent that most people simply accept it without thinking about it. And yet, many Christians make an exception in one area of knowledge. Many who would never consider relying on scripture for nutritional advice are perfectly content to let the Bible be their source for biological theories. A narrow reading of Genesis leads them to reject evolution and favor creationism. And it's not just fundamentalists. Recent polls show that more Americans now believe in creationism than believe in evolution. This, despite the fact that evolution has been observed countless times in the natural world. Here in Kansas, the State Board of Education is planning to revise the state's science standards for high school students, to promote more criticism of evolution. Evolution's critics claim that the theory is grounded in an atheistic worldview. They ask for equal time for other viewpoints. The reality is that the theory of evolution, like all scientific theories, is grounded in a secular worldview. Like all forms of secular knowledge, scientific knowledge is not dependent on a particular religious affiliation. The facts do not change whether one is a Christian, a Muslim, a Hindu, or an agnostic. It's also a reality that many evolutionary biologists are committed Christians. Evolutionary theory would not be where it is today without the contributions of Alfred Russel Wallace, Asa Gray, Theodosius Dobzhansky, or Pierre Teilhard de Chardin. None of these men saw a conflict between their faith and their science. The key is confining science to its proper sphere of knowledge. Science can tell us about the workings of the natural world. Scientific knowledge is grounded in what we can observe with our five senses. It can help us develop new medicines or better farming techniques. It can tell us how to build energy-efficient houses. It can tell us about the origins of species. Science cannot tell us about God. That's not the purpose of secular knowledge. To know God, we must move into the realm of sacred knowledge, which may build on what we know from our senses, or may be given to us through revelation. It is important to recognize that revelation is not like secular knowledge -- it does not derive from our senses. It is not scientific. "Creation science" is a reaction to our society's ever increasing secularization, but it is the wrong answer. Instead of calling people away from a narrow secular worldview, creationism adopts the mindset and attempts to fit God into the equations. In the attempt to bring God into biology class, creationism gives us a secularized God who is in reality just another hypothesis. God is so much greater than a hypothesis. God is so much greater than the bones uncovered by a paleontologist or the fruit flies used in speciation experiments. God is so much greater than anything we can see or touch. To think that the theory of evolution somehow diminishes God, one must already believe in a diminished God. A researcher performing a scientific experiment must take care to control all variables to get an accurate result. That's why creationism will never be science. We cannot control God. The answer to secularism is not to try to fit God into that box. The answer, it seems to me, is to acknowledge the value of secular learning while also acknowledging its limits. Creationism fails on both counts. When I hear the same message from different sources at about the same time, I pay attention -- especially if it relates to a subject that's been on my mind. Monk-in-Training writes about poverty in the world's wealthiest nation, and asks some penetrating questions. He quotes Mark 14:7, "For you always have the poor with you, and you can show kindness to them whenever you wish" What really struck me was the phrase, "you can show kindness to them whenever you wish." The truth is, most of the time I don't wish to show kindness. How do I change my heart? How can I live my faith more consistently? From West Africa, Keith writes about poverty in some of the world's poorest nations, asking, "What will you do?" And in Wichita, Kansas I ask myself, "What can I do?" I could send a check, but is that enough? Does God expect more from me? I also found the Bono interview I linked to yesterday, in which Bono discusses (among other things) his work with Drop the Debt. Researching further about Bono and debt relief, I found this quote from him: "We are the first generation that can say: we have the cash, we have the drugs, we have the science - but do we have the will? Do we have the will to make poverty history?" Do we have the will? Do I have the will? That's three references to global poverty in the last two days. When so many people around me are talking about the same thing, I start paying attention. But what am I going to do? That's the crux of the matter, and I don't yet have a good answer. More on this as the story develops. Bono, the lead singer for U2 and a leading voice in the fight against global poverty, speaks about his faith in Christ in an excerpt from the recent book Bono: In Conversation with Michka Assayas. Hat tip to Richard White for this link. In 1974, a series of floods destroyed crops throughout Bangladesh, putting the nation in a state of famine. At the time, Muhammad Yunus was an economics professor at Chittagong University in southeastern Bangladesh. He grew increasingly frustrated by the disconnect between economic theory and the reality he saw around him. He convinced the university to start a pilot project with the nearby village of Jobra. Students could get college credit by helping the village farmers increase their crop yields. But Yunus saw that the problem was deeper than that, so he sent students to Jobra to interview villagers. He believed that the true experts on poverty were the ones who lived with it every day. Yunus and his students learned that a big part of the problem was systemic. Bangladesh did not have a subsidized public education system. Parents were forced to pay to send their children to school. The cost was prohibitive to poor families, so their children did not get an education. Unable to read or write, they could not get bank loans because they could not fill out the necessary paperwork. Private lenders filled the gap, but they charged extreme interest rates, often more than 100%. Yunus spoke with a woman who made bamboo stools. She was able to find a supplier who would buy bamboo and deliver it to her, then buy the finished stools from her. In this way she avoided taking a loan, but her profit was only fifty poysha -- two cents -- per stool for her labor. She could never save enough money to buy the raw materials then sell them on the open market. Her supplier made ten times the profit that she made. Yunus had the idea to loan her enough money to buy the raw materials, so she could keep the profit herself. She could then use some of her earnings to buy more supplies for the next day. It wouldn't take much seed money to get her started toward financial independence. Yunus and his students continued their interviews. He identified 42 people in the village who could potentially benefit from seed money. He made a loan of 856 taka -- 27 dollars, split among the 42. He told them they could pay it back whenever they were able to pay. Thus was born the concept of microlending. From those humble beginnings, microlending has grown into a worldwide phenomenon. People who could never dream of getting a bank loan are able to receive a few dollars -- just enough to get them started. By paying back the loan plus a modest interest rate, they demonstrate to themselves and others that they are responsible with their finances. They are able to move from abject poverty into a sustainable living. Yunus eventually started Grameen Bank to expand microlending throughout Bangladesh, and then around the world. Yunus isn't the only one to have success with microlending. In Bolivia, John Hatch started FINCA with the philosophy, “Give poor communities the opportunity, and then get out of the way!” Al Whittaker and David Bussau started Opportunity International in Indonesia and Latin America. Like Grameen, these organizations have expanded around the globe. Thanks to the work of microlenders, millions of people around the world have received the help they needed to climb out of poverty. Some recipients have returned to take further loans to expand their businesses, enabling them to hire employees and spread the new wealth. Some have even been able to buy their first homes. Microcredit is not the sole answer to the problems of the developing world. But considering the small investment and the enormous return, microloans are possibly the greatest weapon in our arsenal for the global battle against poverty. This was, after all, a contemporary Christian song, For Future Generations by 4Him. It seems to me that most contemporary Christian music has an otherworldly focus to the point of ignoring the world in which we live. But hearing these lyrics I thought, Have Christian musicians finally realized the importance of taking care of our planet? And yet, despite 4Him's assertion, it's not an either/or proposition. In fact, with the accelerated damage we are causing the earth it's a both/and imperative. We don't care about future generations if we don't care about giving them a habitable climate in which to live. We're not going to save any lives if we turn our farmland into a desert. Unfortunately, it is the "Christian" United States that lags furthest behind in efforts to preserve the world for future generations. When God finished the creation, he looked at the world and said it was very good. The Psalms tell of how much God loves his creation. Jesus spoke of God's care for the birds of the air and the lilies of the field. And we, for the sake of short-term material comfort and an ideal of economic growth, are ruining this wonderful place that God gave us. We use up limited natural resources, we pollute the air and the water, we destroy natural habitats to build shopping centers and sports arenas. The delicate ecosystems God put into place are faltering under our assault. The world is growing warmer. We don't yet know how much irreversible damage we have caused to our climate, or how much of a mess we are leaving for future generations to clean up. On August 6, 1945, the first atomic bomb to be used in warfare was dropped on the city of Hiroshima, Japan. Three days later, a second bomb was dropped on the city of Nagasaki. More than 120,000 people died in the bombings, and nearly a quarter of a million died from lingering effects. These are the only two nuclear weapons ever to have been used in warfare, but the nations of the world have collectively detonated more than 2000 nuclear bombs for purposes of testing. The superpowers monitor the globe with satellites that can give early warnings in case of a nuclear attack. In some cases, these satellites have prevented nuclear war when ground-based detection systems gave false alarms. Does the human race have the wisdom and courage to refrain from using such destructive power? On this anniversary of the world's first nuclear attack, let's pray that there won't ever be another. I cringe when I hear Christians refer to the Bible as the word of God. Fundamentalists use the phrase to mean that God is the true author of the Bible; the writers were just his instruments. The Bible, they say, is a perfect reflection of God's will. Anything that is not in the Bible is not God's will. That view, it seems to me, borders on idolatry. It elevates the Bible to a status it was never intended to have. The Bible becomes the ultimate standard. God is diminished to what we can find in those pages. I can't believe in such a limited God. Besides, doesn't the Bible itself (in the Gospel of John) refer to Christ as the Word of God? Applying that title to the Bible would seem to make it a substitute for Christ. So I cringe when I hear Christians refer to the Bible as the Word of God. Until now. Recently I found an old book in the church library, Exploring the Bible with Children by Dorothy Jean Furnish. It's really meant as a guide for Sunday School teachers, but I thought it might have suggestions I could use in teaching my son when he gets old enough. When I got to chapter two, though, I found the statement, "Christians have given general consent to a description of the Bible, calling it the 'Word of God.'" I was ready to cringe. But Dr. Furnish went on to describe six different ways Christians might understand the phrase "Word of God", and five of them didn't bother me. Approach #1 is the one that causes me to cringe. To equate God with the words of the Bible and only those words seems to place limits on God. But the God I know, the God I speak with regularly, is bigger than that. My own understanding of the Bible is similar to #4 and #5, a little closer to #5 than to #4, but both of them seem compatible with my understanding. And though I don't fully agree with #2, #3, or #6, I can see where people might understand it in these ways, and can respect them for that. I think God speaks to us in the ways in which we can hear, and if that means different people get different messages from the same Scriptures, it only shows God's ingenuity in reaching out to us. So maybe now I can stop cringing when I hear someone call the Bible "the word of God." I'm not ready to use the phrase myself, but I'll try to be more open when others say it. They might not mean what I think they mean. The United States is the most Christian nation in the industrial world, according to surveys, but it is often the least Christian nation in its actions. In a recent article, Bill McKibben explores The Christian Paradox. President Bush has stepped into the debate about evolution, arguing that students should be "exposed to different ideas," particularly the idea of Intelligent Design (ID). Certainly it's good to expose students to ideas. The question here, it seems to me, is which ideas should be taught in science classes. According to the National Center for Science Education, ID does not qualify as a scientific theory. Biochemist Michael Behe and mathematician William Dembski have been working for nearly a decade now to develop the theory, but have not gained the acceptance of the scientific community. The reason for scientists' skepticism is that ID has not provided a comprehensive alternative to evolution. If it doesn't explain a wide variety of phenomena that can be observed every day, ID can't be called science. There is an ironic precedent for this state of affairs. In 1927, a Belgian physicist and Jesuit priest named Georges Lemaitre proposed that the universe began with an explosion from what Lemaitre called a "primeval atom". The scientific consensus at the time was that the universe had existed forever. Lemaitre was accused of mixing his science with religion. His primeval atom theory was ridiculed by most scientists. Subsequent research and observations, and an accidental discovery by Arno Penzias and Robert Wilson in 1964, proved conclusively that the universe had a beginning after all. Lemaitre was vindicated; his theory is now accepted as mainstream science. We know it, however, by the derisive name its opponents applied to it: the Big Bang. Will Intelligent Design follow the same path? The odds are against it. For every theory that eventually becomes mainstream science, countless other theories are discarded for lack of evidence or lack of explanatory power. But who knows what the future may hold? ID, as it is expressed today, is not science. It should not be taught as science. Its proponents have not amassed a body of supporting evidence that can account for more phenomena than the theory of evolution. Should students be exposed to the idea of intelligent design? It wouldn't hurt to mention that some scientists espouse the idea. Maybe those students would be inspired to become research scientists, to confirm or refute the tenets of ID. But in today's classrooms, it would be irresponsible to teach ID as a valid scientific theory that has equal standing with evolution.